DHAKA, Jul 28 2017 (IPS) - In the wake of recent water-related disasters in Bangladesh, including water-logging and floods that displaced thousands of families, a high-level consultation in the capital Dhaka on valuing water will look at ways to optimize water use and solutions to water-related problems facing South Asia. While Bangladesh has been heavily affected, it is hardly alone in grappling with both chronic shortages and overabundance. According to the UN World Water Development Report, critical transboundary rivers such as the Ganges, Indus and Brahmaputra have come under severe pressure from industrial development, urbanization, population growth and environmental pollution. Freshwater - a finite resource - is under particular pressure from population growth worldwide and other causes, compounding the challenges of extreme climate events like droughts and floods. In India, nearly two dozen cities face daily water shortages; in the Nepali capital, Kathmandu, people wait in lines for hours to get drinking water from the city’s ancient stone waterspouts; in Pakistan, the Council of Research in Water Resources (PCRWR) warned that the country may run dry by 2025 if authorities didn’t take immediate action. Regional cooperation will be a critical component in solving these interrelated problems. On July 31, ministers, senior and local government officials, businesses and representatives from non-governmental organisations (NGOs) and development partners will attend the Fourth Consultation on Valuing Water to be held at the BRAC Center in Dhaka. The consultation is being held as part of a high-level consultation on water called the ‘Valuing Water Initiative’. Bangladesh is one of the most densely populated countries in the world, with 160 million people living within 57,000 square miles. 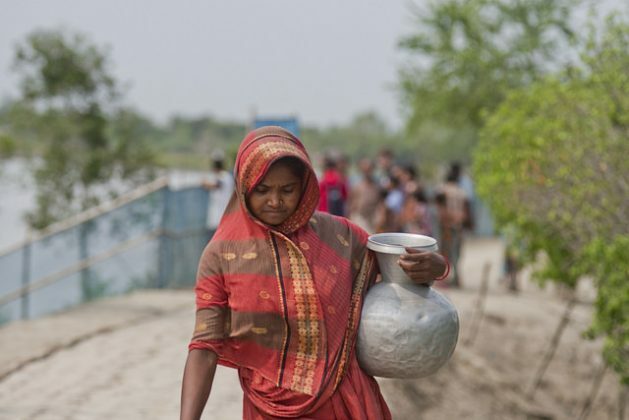 Although it has made great strides against poverty in recent years, some 13 percent of Bangladeshis still lack safe water and 39 percent lack improved sanitation. In January 2016, World Bank Group President Jim Yong Kim and then UN Secretary-General Ban Ki-Moon convened a High Level Panel on Water (HLPW), involving 11 heads of state and government to accelerate change in the way governments, societies, and the private sector use and manage water. The members of the panel are heads of state from Australia, Bangladesh, Hungary, Jordan, Mauritius (co-chair), Mexico (co-chair), Netherlands, Peru, Senegal, South Africa and Tajikistan. According to Global Water Partnership, an organiser of the Dhaka water event, Bangladesh is one of several countries to host a HLPW consultation meeting, which aims at providing the leadership required to champion a comprehensive, inclusive, and collaborative way of developing and managing water resources, and improving water and sanitation-related services. Dr Khondaker Azharul Haq, President of Bangladesh Water Partnership (BWP), said that apart from its direct economic value, water has indirect value for environmental protection, religious, cultural and medicinal practices. This non-economic value is very high because water is declining across the world day by day, both in quality and quantity, he said. As a lower riparian country, Bangladesh faces multiple water problems each year. The country must depend on the water of trans-boundary rivers, experiencing plenty of water during monsoon and scant water during the dry season. During this monsoon season, Dhaka and the port city of Chittagong are facing severe water-logging and urban flooding due to the lack of proper storm water drainage systems. During monsoon, water-logging is also a common phenomenon in Chittagong city. But this year, a vaster area of the city than usual has submerged due to heavy rainfall coupled with tidal surges. Dr. Azharul Haq says the “nuisance value” of water is also going up, with a good deal of suffering stemming from these problems. “So water management should be more comprehensive to obtain the [full] potential value of water,” he said. He added that the “nuisance value” of water, along with its economic and non-economic values, will be discussed at the July 31 event. Experts have long warned that if the authorities here don’t take serious measures to address these issues soon, within a decade, every major thoroughfare in the capital Dhaka will be inundated and a majority of neighborhoods will end up underwater after heavy precipitation. A 42-mm rainfall in ninety minutes is not unusual for monsoon season, but Dhaka will face far worse in the future due to expected global temperature increases. 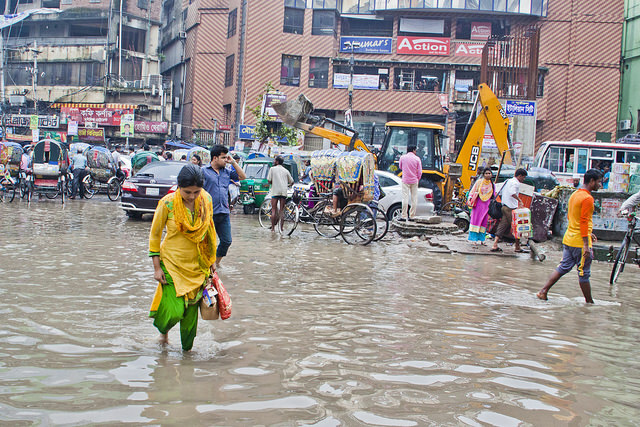 “If the present trend of city governance continues, all city streets will be flooded during monsoon in a decade, intensifying the suffering of city dwellers, and people will be compelled to leave the city,” urban planner Dr. Maksudur Rahman told IPS last year. He predicted that about 50-60 percent of the city will be inundated in ten years if it experiences even a moderate rainfall. Dhaka is home to about 14 million people and is the centre of the country’s growth, but it has practically zero capacity to cope with moderate to heavy rains. On Sep. 1, 2015, for example, a total of 42 millimeters fell in an hour and a half, collapsing the city’s drainage system. The HLPW’s Valuing Water Initiative is a collaborative process aimed at building champions and ownership at all levels, which presents a unique and mutually reinforcing opportunity to meet all 17 of the Sustainable Development Goals (SDGs). Freshwater – a finite resource – is under particular pressure from population growth worldwide and other causes, compounding the challenges of extreme climate events like droughts and floods. Water is essential for human health, food security, energy supplies, sustaining cities and the environment. Valuing water more appropriately can help balance the multiple uses and services provided by water and inform decisions about allocating water across uses and services to maximise well-being. The main objective of the July 31 water consultation is to obtain views from a wide array of country-level stakeholders on the proposals from the HLPW on the valuing water preamble and principles. The water meet will encourage governments, business and civil society to consider water’s multiple values and to guide the transparent incorporation of these values into decision-making by policymakers, communities, and businesses. The HLPW consultation will also create awareness and discuss the regional or country level relevance of global perspectives.